Machining is any of various processes in which a piece of raw material is cut into a desired final shape and size by a controlled material-removal process. The Precision Machined Parts are widely used in the manufacturing of automobiles, computers, medical equipment, and power hand tools. CNC milling devices are the most widely used type of CNC machine. 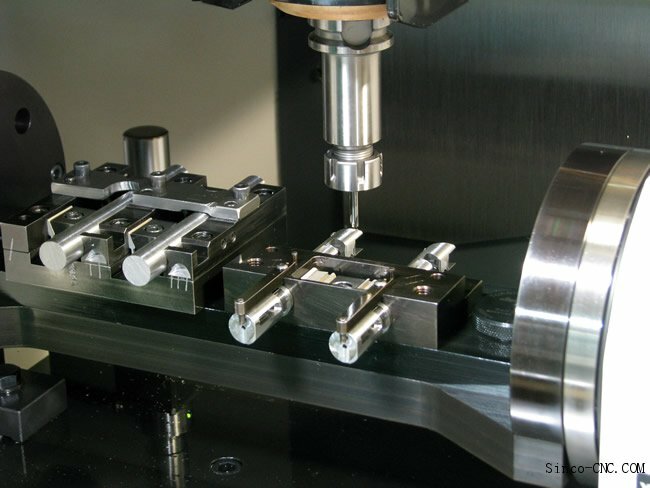 Most CNC milling machines also integrate a device for pumping cutting fluid to the cutting tool during machining. Milling has several advantages over other manufacturing processes. It is cost effective for short runs. Complex shapes and high dimensional tolerances are possible. Smooth finishes can be achieved. CNC milling can produce almost any 2D or 3D shape provided that the rotating cutting tools can reach the material to be removed. Examples of parts include engine components, mold tooling, complex mechanisms, enclosures, etc. As the milling process applies pressure to the material, weak shapes are difficult to machine, such as long thin shapes and thin walls. We stock a wide variety of materials, use state-of-the-art machines and diligently follow all design specifications. We continually strive to improve and optimize our processes and maximize customer convenience. Our customers range from inventors to businesses to government agencies. We are focused on quality and customer service. We are one of the manufacturing of Precision CNC Machining and Precision machined parts industry in india and We have 35 years experience in this . We at, Deccan Engineering Works are specialize in the development, creation, and manufacturing of Precision Machined Parts for the multiple industries like Precision Frames, Mirror Finish Stainless Steel Panels, Plastics Fabrication and Complex Mechanical Assembly.